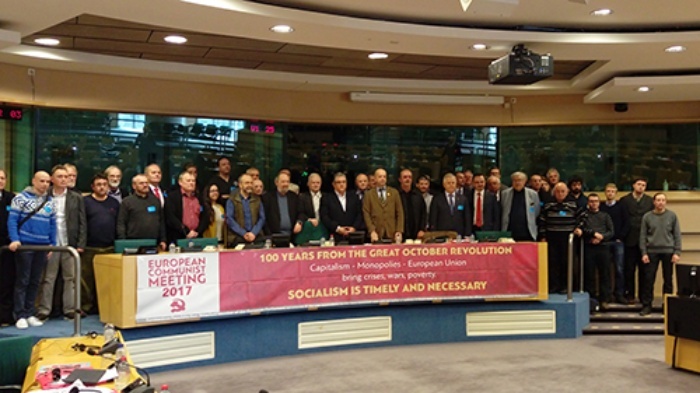 The 10th European Communist Meeting which was hosted by KKE’s Delegation to The European Parliament, was held with the participation of 41 communist and workers' parties. At the meeting, issues related to imperialist, the working class and the now and the future of the communist movement were discussed. Stepping into the 100th anniversary of Great October Revolution in a world where anti-communist oppressions are growing, the contradictions between monopolies and the related crisis is deepening, the obligation for a revolutionary uprising of the working class was emphasized. The vanguarding role of the communist parties in the struggle against imperialist aggression and anti-communist propoganda of NATO and EU was also among the important points made by the communist parties. In their introductory speech, KKE mentioned that the role of opportunist and reformist positions taken to manage capitalism and stated the only solution for the problems of the people bypasses a working class revolution. “Capitalism may still be strong today, but it is not invincible. The capitalist crisis has demonstrated more intensely the historic boundaries of the capitalist system. The imperialist unions, such as the EU and NATO, which are established on the terrain of capitalism and for the defense of the monopoly interests, are not free of inter-imperialist antagonisms, both inside them and with other imperialist powers. Especially in the current phase, during which we must be more concerned about their contradictions, with the emergence of populist, far-right, eurosceptic forces in a reactionary direction in all the countries of Europe, as well as with the election of Trump in the USA. Of course, it remains to be seen how US policy will be expressed after the official inauguration of the Presidency, because the election struggle has other elements, populism. Of course, the USA will continue its imperialist political line, as it is the number 1 economic and military power in the world. However, they are worried about China’s elevation into the 2nd position in the international economy and of course they worry about the balance of trade that is negative for the USA and positive for China. Particularly when China is the number 1 creditor country of the USA, which owes China over 1.5 trillion dollars. So the USA sees China as its number 1 enemy today, which has good relations with Russia which is the second strongest military power in the world. For the full speech of KKE see the link. The participating parties to the 10th European Communist Meeting expressed their determination to turn the century of crisis into a cradle for revolutions which are more stong with the achievements of the Great October Socialist Revolution.